Peacefully on 6 February 2019 at Te Whanau Rest Home, Levin. Aged 90 years. Loved sweetheart of Vivienne, and of the late Colleen. Bronia Walker, Andeana and Dayton Hakaraia. 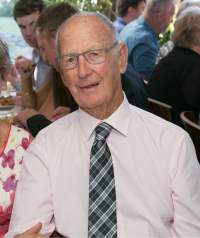 A celebration of Joe’s life will be held at Te Horo Hall, School Road, Te Horo on Monday 11 February at 2pm followed by private cremation. Donations to The Cancer Society in memory of Joe would be appreciated and maybe left at the service.